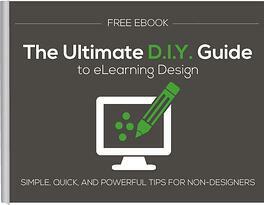 If you don't consider yourself a design expert, but you do treat design as a crucial aspect of eLearning and understand its importance... this eBook is for you! The Ultimate DIY Guide to eLearning Design we'll show you that you don’t have to be an expert to create effective and good looking courses. You only have to understand the basics well and execute it. How you (a non-designer) can create eLearning screens that wow. Tons of simple tips that will fool anyone into thinking you’re a pro! Design secrets to help you engage learners.